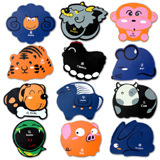 Type: Mouse Pad (animal) (assorted colors). Colorful cute cartoon pattern. For a mouse pad. Notify me of updates to Mouse PAD (cloth) Animal.